Welcome to 10 Champa Dr. 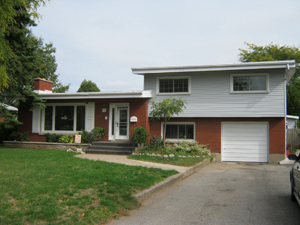 This northend home is a 4 level side split with 3 good sized bedrooms and 2 baths. It is an excellent set up for a large family or a possible ground floor in-law suite. The spacious foyer leads into the living room with a large end wall wood fireplace. The large eat-in kitchen gives access to the backyard. The lower level features a complete built-in home theatre with a 144” screen and elevated seating. The large shed in the backyard has electrical service – great for the handyman! R/O water filtration system and 6 appliances included. Electrical service is on breakers. Property Taxes for 2012 are $3500. View this house and make it your home!